Design and communication professionals should be really excited about a recent development in mapping: ArcGIS maps for the Adobe Creative Cloud. GIS (Geographic Information System) software links location information in the form of databases with latitude and longitude coordinates to different types of information: demographic data to census tracts or divisions, election results to states, land use to natural or urban areas, etc. The user decides what layers (which may come from government or private sources) are going to be combined in order to visualize, analyze, and interpret the data to show relationships, patterns, and trends. As I mentioned in a previous post, GIS packages such as ESRI’s ArcGIS are rarely used by designers or news infographics departments as they are expensive, difficult to learn specialized tools normally used by GIS analysts and cartographers. With very, very few exceptions, those designers and graphics editors limit themselves to fairly basic mapping techniques that don’t take advantage of the power of GIS to uncover patterns through spatial analysis of large datasets. 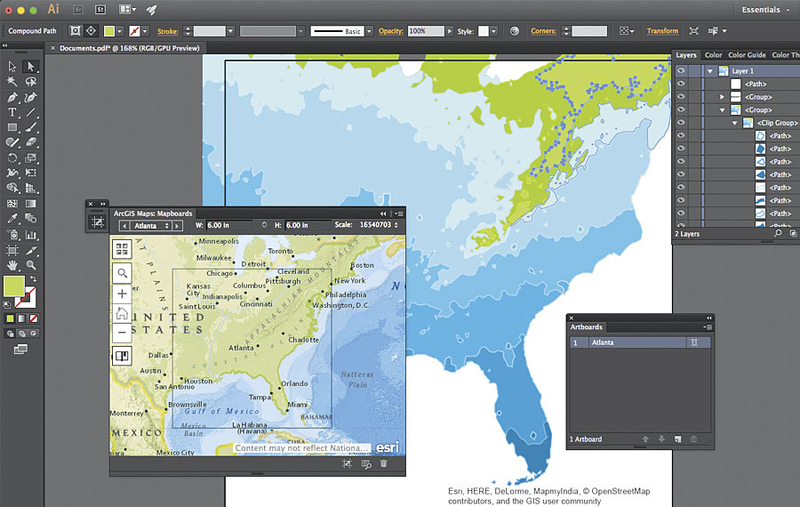 The partnership between ESRI and Adobe offers ArcGIS functions within Adobe Illustrator and Photoshop via an extension or plugin. 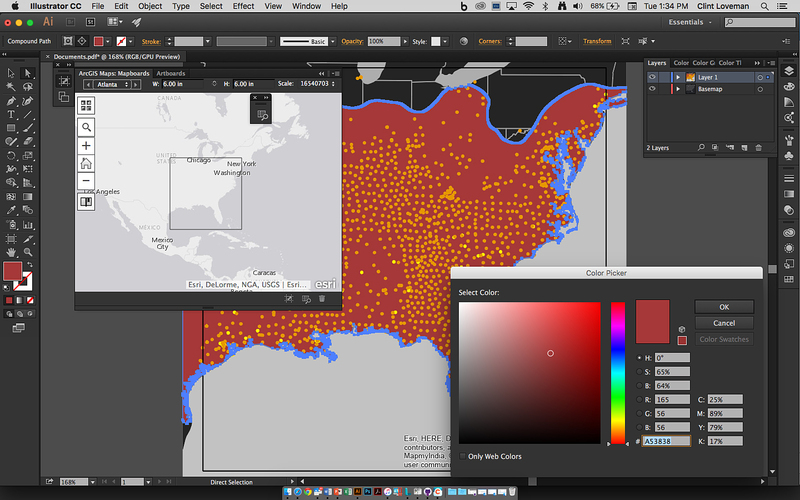 Designers can access thousands of data-driven map layers inside the Adobe programs as vectors or raster files, and play with colors, layers and styles to customize the maps using the familiar tools of Illustrator and Photoshop. Creating maps with the extension is fairly straightforward. Without leaving Illustrator and Photoshop you define the area extent, size and scale of the base map, then search for data map layers (street maps, political boundaries, terrain, satellite images, election data, demographic information, economic indicators, environmental, etc), and finally you add/download the map to your Adobe workspace. It’s then already arranged in layers and ready to edit and polish by manipulating colors, appearance and fonts with the usual Illustrator and Photoshop tools. You can get the beta version here. It has been available for a while, and the first full version is slated for release in the second Quarter of 2017, with no specific date yet (it’s been delayed before). Some of the functions are clunky and/or slow, but it is definitely great news and I can imagine how in few years this may become an essential tool for infographics designers to create and publish advanced data maps. You do require a subscription to ArcGIS Online (pricing info here) to be able to sign in but there is a trial version available. This entry was posted in Maps, News, Uncategorized by 5wgraphicsblog. Bookmark the permalink.